The pickup truck renaissance is just beginning at General Motors, as the company plans to rollout more than just the new Chevrolet Silverado and GMC Sierra in the next few years. Not only will the company be offering new half-ton trucks, but also enhanced Heavy Duty models and a line of medium sized trucks by 2014, according to reports. There has been plenty of hype and mystique around the all-new Chevrolet Colorado and GMC Canyon being developed for the North American market. Though based on previous information, we believe they will be 2015 models. And proportionately, the trucks will be 90-95 percent the size of the new Chevy Silverado and GMC Sierra, which sounds too close to the big models to us. But maybe people will go for them, regardless. Hi everyone , the video of the introduction of the 2014 Silverado and Sierra, the GM Rep said that in 2013 not only the HD and SUVs would be introduce but that the new 2014 Colorado and Canyon would be out too. That close in size? That’s no good. I’d say shrink it to S10 size. And what a waste of money it would be to sell this and not the TrailBlazer. It will be interesting to see if the coming Colorado varies from what most of the world has gotten. 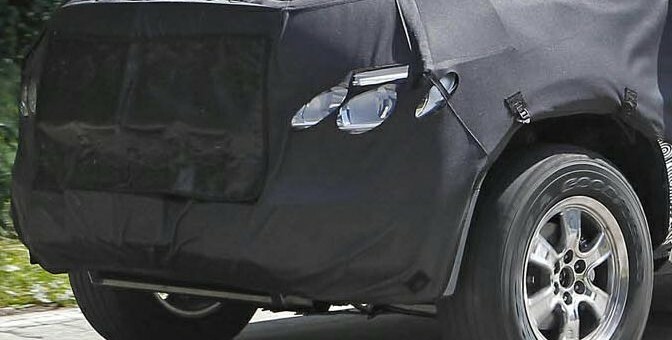 Will it retain its cutesy, car-like look, add bulk to “man up” and more closely resemble the new Silverado, or will they give us something a bit more agile and rugged appearing (my vote)? Whatever they do, they’ll have to improve upon what we’ve seen so far inside and out, give it significantly better gas mileage than the full size, and come in well below the Silverado in price; otherwise, why bother? Is this the same truck the rest of the world already has? If so, why the long wait? I can see this with the new updated 4.3L.. Which I think will be a perfect fit, that and have the 2.8L come over later.. I understand most mid sized trucks are about that size.. If its 90-95 % the size of a full size truck what is the savings going to be.. The price of the truck compared to the full sized ones. With the recent travesty that was revealed as the “all-new” trucks, I can’t help but wonder how this opportunity will be thoroughly squandered. I wish the new Colorado would be a compact rather than a mid-size pickup truck capable of hauling 4 x 8 sheets. Nonetheless, I’m hoping it does come with a diesel option and achieves an IIHS top safety pick plus. Will they build it in a long box?Currently there NO domestic compact pickups with long beds that I am aware of. I will be replacing my aging and hard working 2003 Sonoma longbox next year.There is a lot of pent -up demand for compact longbed gas thrifty work trucks as they havent existed for almost 10 years.Short box trucks simply dont have the room to work for most tradesmen. Hopefully GM will think about us working guys who are loyal to domestic trucks and quit building what are essentially compact toy trucks. If not,our all- GM garage will cease to be so. I think if they put a 2.8 diesel in it, I would put my order in .20mpg in town and 31 mpg highway and 348lb torgue thats the same as my 5.3 vortec.my 5.3 vortec only gets 13mpg city and 18.5 highway.I dont mined a smaller truck, my truck is like driveing a buss and as long as it can towe 5,000lb I’m good. Gm seems to be a specialits at dragging out proposed new vehicules. I have waited long enough. I am going out and buying in the next month or so the new Jeep Cherokee diesel as soon as it is avaiblae in our area. Please bring this truck sooner than later because I am seriously considering a toyota which are made in the US and not in china !! Please, please put the shifter back on the column like the Colorado & Canyon are already. Don’t make the same mistake Toyota/Nissan did by putting the shifter on the floor. It takes up space that can be used for other things. I HAVE OWNED 2 OF THESE TRUCKS AND THEY WORK GREAT THE WAY THEY ARE! Love them. Just need an updated cabin with blue tooth and ipod connect etc…Leave well enough alone. Very reliable trucks. Just hurry up and release them. God GM drags their feet.